Your favorite local National Weather Service office came out with this graphic this morning depicting what can happen in April (as if we needed reminding, huh?). Northwest flow will continue the unseasonably cold and dry weather pattern through Tuesday night. Temperatures will average 15 to 20 degrees below normal. This cold pattern will end Wednesday as winds become more southwest and usher in a more mild air mass. An active weather pattern will take shape into the weekend, with light precipitation chances late Wednesday into Thursday, and again Friday and Saturday. A stronger system is taking shape for the start of next week. At this time, temperatures appear cold enough for the possibility of a mixture of rain and snow late Sunday and Monday, with a better chance of snow across central Minnesota. It is too early to pin point snowfall accumulations, and even if snow will be the dominate precipitation type. However, a wetter pattern for the Upper Midwest is likely. @Bill,Anonymous from last thread last post seemed to beat you to the punch slightly when he was trying to drum up discussion over what NWS has forecasted for this weekend and what Novak was forecasting,they are both widely different forecasts and would be interesting to add to this thread so all could see and add their discussion since it pertained to this coming weekend. I guess before I do a game time forecast, I should make sure I know what time the game starts. I was thinking 7pm start time, as opposed to the 4:10pm start. Oh well :) Still watching the weekend system...still differences in the models but the system looks impressive overall. I really do love when the seasons change because the weather can do some crazy stuff but I also hate it because it is a difficult thing to forecast. Side note...watch for a severe weather set up next week in the central and southern plains. I mentioned a while ago that mid April could get interesting for those areas, and it appears as though the first good set up may show up in about 8 to 10 days. Tell me how this works,both Paul Huttner and Paul Douglas use the Euro solution in their respective blogs last night(4/1 PM),they are both going hog wild over the warming trend after today,using the euro numbers they circle the celsius numbers and speak of the 50's and possible 60's coming thru Sunday(4/7),then the euro has 0,2,2 celsius Monday thru Wednesday,even has 1.33" of precip late Sunday into Monday,certainly cold enough for snow,yet not one mention from either of them of a possible snowstorm or even mention the 3 day cold snap.....all they do is rave about the warm air depicted by the euro and say nothing about the cold air that the euro is depicting afterwards,isnt the euro king?doesn't everyone follow the euro first then all the rest of the models,so when their favorite euro is saying much colder air to follow with snow a possibility,Paul Douglas says a cold rain for late Sunday into Monday and even says to ignore the snowy rumors for late week....so what is it? believe it when it says its going to warm up,but dont believe it when it says its going to cool.If your going to have full disclosure and show what the models are saying then discuss it all,just don't hand pick what your trying to sell. Please learn to use punctuation correctly. Your post is nearly unreadable. Really, Disco80? I think big daddy made some great points and I think most of us can read past the punctuation. Regarding the snow--Bring It! 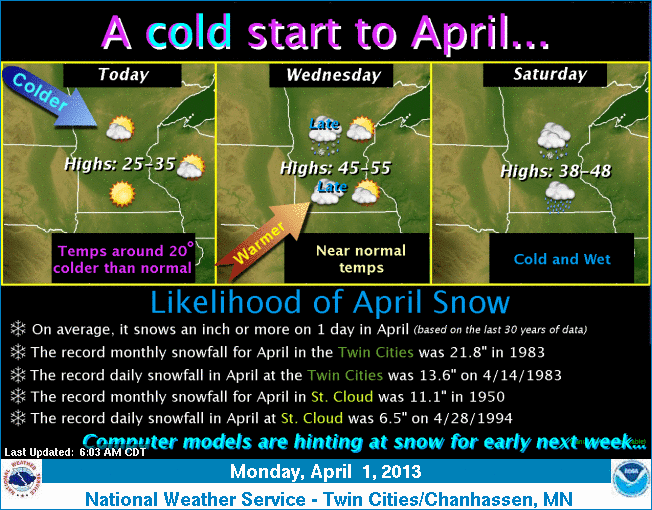 An April snowstorm would be awesome and would be even better if it was record setting. Agree Plymouth Weather Lover. We're not all gifted writers. @Big Daddy made some good points and is a great contributor to the blog. Thank you @PWL and @Bill for your comments.....@Disco80 sorry I'm not an English professor,I do agree that I tend to go off on an tanget when I'm trying to make a point,but I believe you can make out what I'm trying to say with or without the proper punctuation and if you visited their blog and read it you would see exactly what I meant,which if I'm not mistaken you look at regularly do you not? Well April storms are not that unusual and one this year would be appropriate. Forty years ago on April 7th and 8th Kansas and northern Missouri were nailed with a big one! I know this because the first pic in my baby book my Grandmother did was my Grandpa on the tractor plowing her way to the bus stop to her to western Kansas for my birth on the 10th. So I am full on expecting there to be something big this coming weekend. Nothing like a blizzard in April to celebrate turning 40 with. Good news for all of you who can't stand the sight of green grass! The Euro has a thoroughly depressing extended forecast. Only one day with a high above 50 over the next ten days. Otherwise all 30s and 40s. The weather is very changeable these days,as it is every April as we transition further into spring(much later start this season though),but I think its premature for whomever forecasts our weather to use words like "likely" one week in advance,like one of TMF's key contributer has on social media when he declared 60's and 70's LIKELY this coming weekend,while our NWS has much colder surface temps hanging in the low to mid 40's Friday thru Sunday and even mentions chances of snow,so what does the rest of TMF nation think of these developments for our upcoming weekend? And I see you figured it out that it was Novak who made the declaration of this phantom warmth,needless to say he was premature and inaccurate with his bold prediction,in my opinion he is way too aggressive with his forecasting,yes he will get it correct once in awhile with his bold predictions because weather can be so dynamic,but when you live on the edge you live and die by the sword. 60's-70's is that a joke?,was Novak pulling an April Fools on someone on facebook? As far as I can tell after tommorrow temps won't be cracking 50 for the forseeable future with somedays struggling to crack 40! KS95(Dave Dahl):Snow is not done for us yet...snow mixing with rain late Sun/Monday and again Tuesday,we average 3.5" of snow in April,so don't be surprised if we see that. WCCO Radio(Mike Lynch):Winter isn't over....we could be shoveling next Tuesday and Wednesday. Man that Euro has been consistent with the snow and cold it is depicting for next week,and it looks like some people are finally starting to acknowledge it with what I wrote above as well as Paul Huttner(MPR)who last evening showed the Euro again without a word of snow,but long and behold this morning he finally acknowledges what the Euro is depicting and even cracks a joke about it that he's not sold on the Euro(funny when he doesn't like what its forecasting he is reluctant about it)or is afraid of it.Even Paul Douglas in his blog is reluctant to mention snow,even though the Euro graphic he shows has temps around freezing with snow icons on it and he goes on to say,"main event coming late Tuesday into Wednesday of next week,probably warm enough for rain,we can only hope! "Seems like he too is abit afraid of what the Euro is showing. So I ask you all this question if the Euro is "King",like most mets and others on this blog have said,why is everyone so reluctant on what it is depicting for next week,sure the other models say something totally different,but we never give a crap what they say anyways and always say they will fall inline with the euro solution,don't we. Good stuff @Big Daddy. Nice to hear what others are saying. NWS morning graphic shows several inches of snow for Friday night as close to the metro as northern Anoka County! They say the low will track across far southern Minnesota,so we will be on the colder side of this system here in the metro,if this tracks even further south let's say into Iowa don't be surprised if the rain/snow line moves even closer to the Twin Cities. 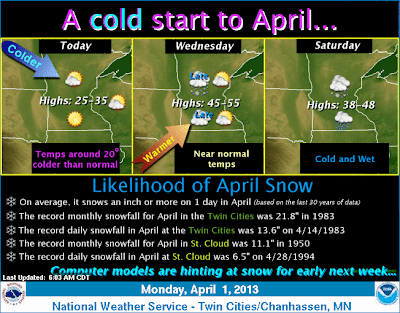 Kinda cool to be tracking snow chances in April,after last years awful winter. Man oh man this time of year is fun. Pattern changes are always fun to try to figure out, especially if you've never really had the full education that the pros out there have. It still appears as though we will see that trough develop in the west, but the ridge in the east may not be far enough to the west to give us some nicer warmth. The key here is that temps during the day are still above freezing so the snow melt will continue. Our problem, and the problem I talked about a while ago, is the snowpack to our north into Canada. They still have a lot of snow to melt, so their temps are staying much colder than normal. Until they can get to melting their snow, that cold air will be available to tap into when systems get close enough to us. Hopefully we don't end up adding more snow to things, so that the melt can continue but with the snow and cold to our north, and warm air trying to continue its push north, it should set the stage for a battleground in the middle. Severe storms in the central and southern plains continues to look likely next week and could end up being the first big outbreak of what could be an active April and May. The AO is going way positive, the PNA is going negative, and the NAO is going positive. I really thought we would finally get into that warmer air with a flow from the southwest, but I guess that just isn't the case yet. NWS's graphic for Friday night now has the rain/snow line covering all of Anoka county and northern Hennipen county,storm tracking further south?,is that the reason for the shift of the line? Even though I don't believe one should have to do so on this board, I'm chomping at the bit to defend myself from 'Anonymous' and his/her remarks. First thing I will say is this. Before you spout off about something, it is best to wait until your comments verify. Quite frankly, I will be surprised if much of southern MN does not make it well into the 50s/60s this weekend, especially on Sunday. If that doesn't happen THEN it may be an appropriate time for 'Anonymous' to chime in. One thing I am quite confident in is that we will not be in the low 40s with snow like our friend 'Anonymous' predicts. Secondly, I feel it is a shame that we let people like 'Anonymous' post on this board. This BLOG is all about conversation and throwing around scenarios. It is not about criticizing people's opinions/forecasts and tearing them down. I realize that nobody really cares what 'Anonymous' says because this individual is always makes a fool of themselves, but still. If a person posts on this board because they have a vendetta and/or an axe to grind, get them off. Finally, if 'Anonymous' is allowed to continue to post, then so be it. It will at least provide an opportunity for the rest of us to laugh. Here's to hoping for a near or above average temperature weekend...Cheers! Couldn't agree more with what Novak said. This should be an opportunity for people to maybe learn some stuff about the weather and forecasting, as opposed to bashing those who throw their predictions out there. Nobody is perfect with a forecast because it isn't a perfect science. For the record, models were, on a fairly constant basis, showing temps getting close to that 70 degree mark. Honestly, I thought it could happen too. Everything was shifting and it seemed legit. Ok, so maybe we don't get that warm now, and there's nothing we can do about that. This is just part of the joys that are forecasting. You're predicting the future! It's not as easy as one would think. I do encourage everyone, though, to give it a shot. Take a look at the forecast models, and throw your thoughts out there. Why not, right? Final notes...weekend system comes ashore tonight so we should get some better looks at it with tomorrows forecast runs. Next week still looks quite active with lots of precip opportunities. It even looks like some of the higher drought areas across the country will see a good dose of rain, so that's good news for them. Creeks and rivers will really start to come up next week if these forecasts verify. The ground is still quite frozen so most of the water will run off. Long range does start to bubble the warmer air further north, but hey that's long range and certainly can go away. Fingers crossed it verifies. Geez - what is happening to people these days. It appears everyone feels the need to fight and argue and those who feel wrongly accused feel the need to strike back. This can be a great source of interest and learning. I think people should post their comments and try to be repsectful. If you feel accussed - ignore em and let the blog owner deal with it. Yeah -common courtesy doesn't happen much these days. If the comments include criticism deemed too harsh by the blog owner he can decide whether to delete the comments or ban them. BTW - Duane - what a breath of fresh air - good posts and you know how to stay above the bickering. Yes, the emphasis of this blog has to be on education and sharing of experiences as a weather consumer. On that note, I'd love to see all the people who sign in as "Anonymous" take a name. This will help as we banter about ideas and share thoughts. Thanks. Ok, now that I got that off my chest, I'm ready to chime in about fun stuff. I'm still thinking that temps this weekend will be near or above average, especially on Sunday. Temps should be in the low 50s. I wouldn't be surprised if some areas of southern MN reach well into the 60s to near 70 degrees. That may be a bit optimistic for the MSP metro, but 60+ is not out of the question. Needless to say, the talk about cold & snow was way over-blown. I hope the public did not buy into that garbage. Simply put, it is extremely difficult to receive accumulating snow in April so it is better to stay conservative with the snow talk. As far as precip. is concerned this weekend, I'm concerned that quite a bit of it will fall over the Upper Midwest. One round of precip late FRI into SAT (northern areas) then the next late Sunday (southern areas). By early next week, gut feeling is that the flood talk will start to intensify, especially when considering what we potentially have coming down the pipeline for next WED-THUR. Speaking of that, wow do the models look impressive with that storm coming out of the Rockies. I'm anxious to see how that sucker evolves. Definite Block-Buster potential. However, I get leery this time of the year since we are in "cut-off" season. Lows tend to really wrap-up and barely move. In turn, they sit and spin over one area and this throws the models into a frenzy and cause forecast to bust BIG TIME. @Novak when you say block-buster potential are you refering to a heavy rainfall with flooding potential are is a heavy snowfall still possible with that Wed-Thursday system?Thanks for all your input,don't mind the anonymous trolls. Honestly, it could end up being both for the state of Minnesota. The cold sector would end up in northwest Minnesota, while the metro would be in the warm sector. That system is a ways out but certainly makes sense with the big trough digging in out west. In fact, it wouldn't surprise me in the least to see some stronger (maybe even severe?) storms close as southern and central Iowa. There is a lot of moisture showing on the models with that system as well, so it will have to be watched for its flooding potential. The temp contrast from NW Minnesota to SE Minnesota is really impressive, which is perfect for brewing up a big storm. Needless to say, that storm will definitely be worth watching. It's 6 days out so still plenty of time for different shifts in the track. Bill and Novak great vid. Thanks. I have been quiet about this weekends system because I have never been that impressed with it other than the liquid precip that should fall, as this should not be surprising for April with the exception of the ground being mostly frozen still and the flooding issue's it may cause. For the last few days I've been watching the late Monday into Wednesday's system. I'm zeroing in on the Canadian model (known as the GEM/CMC and GGEM all refer to the same model) as it was the superior model with the last major snow storm that impacted SE MN and the monster that hit the Indianapolis area around the 24th of March. With the Indianapolis storm it sometimes showed the heavier snows south of that area, but I thought this was caused by convective feedback issues. In other words when it was south, it showed heavy precip just north of the center of the surface circulation, show much so that it caused the surface low to be suppressed to the south as the precip blocked it from moving north, when I saw that I ignored it. That brings us back to next weeks system. Both the 03/12z and the 04/0z runs of that model showed very heavy precip just north of the surface low, and well south of us but it wasn't localized, it stretched across 2 to 2 1/2 states west to east!! That in my mind was very unrealistic. So the 04/12z seems to have lost that feature and the system has started to move further north. However as the system moved north a large area of heavy precip has shown up just west of the center of the surface circulation causing the low to track further east, this I think is wrong, and I believe the low should track further north than what it's showing. I think suppression well to our south is the wrong solution, but how far north it tracks is very much in question. At this time my best bet is that if suppression does not happen far south eastern MN could see some accumulating snows from this. The Metro to hard to tell at this time. Even though I loved the video, I question how far south this system will be suppressed, and I hope I've have explained the reason why. For those of you that are weather enthusiasts and are on Facebook and twitter (I am on neither) please help the NWS, they asking for your input!!! Thanks Randy. Just put a tweet out about that.